Charles Elson "Buddy" Roemer III (born 4 October 1943) is an American politeecian an banker. He servit as the 52nt Govrenor o Louisiana frae 1988 tae 1992. He last servit as a member o the Unitit States House o Representatives frae 1981 tae 1988. Roemer wis a candidate for the presidential nominations o the Republican Pairty an the Reform Pairty in 2012. He widrew frae those contests an soucht the 2012 Americans Elect presidential nomination till that group annoonced it wad nae field a candidate in 2012 acause no candidate reached the required minimum threshold o support tae be leetit on its ballot. Buddy Roemer endorsed Gary Johnson, a govrenor o New Mexico, for U.S. Preses in 2012. In Mairch 1991, while servin as govrenor, Roemer switchit his pairty frae the Democratic tae the Republican Pairty. In 2012, he acame a member o the Reform Pairty. Roemer wis born in Shreveport, Louisiana. His parents war Charles Elson "Budgie" Roemer, II an Adeline McDade. He wis raisit in Bossier Ceety. In 1964, he graduatit frae Harvard College wi a Bachelor o Arts degree in economics. In 1967, he receivit an MBA in finance frae Harvard Buisness Schuil. Efter college, Roemer returnit tae Louisiana tae wirk in his faither’s computer buisness an later foondit twa banks. He wis electit in 1972 as a delegate tae the Louisiana Constitutional Convention held in 1973. As a member o Congress, Roemer Louisiana's 1st congressional destrict in the northwastren section o the state, anchorit aboot Shreveport an Bossier Ceety. Efter his 1980 election victory, Roemer won congressional re-election wioot opposeetion in 1982, 1984, an 1986. In Congress, Roemer frequently supportit Ronald Reagan policy initiatives an foucht wi the Democratic congressional leadership, thou he remainit in the party. He an aa creeticizit then Democratic Hopse leader Tip O'Neill o Massachusetts for bein "too liberal". Efter Roemer left the Hoose tae acome govrenor, he wis succeedit bi his administrative assistant, Republican Jim McCrery. Roemer wis ane o a lairge nummer o Democratic candidates tae challenge three-term incumbent governor Edwin Edwards. Roemer won the election bi winnin 33% o the vote comparit tae Edwards' 28%. Roemer enterit the govrenor's office on 14 Mairch 1988. In October 1989, voters rejectit a nummer o Roemer tax initiatives but approvit a constitutional amendment for transportation improvements. Facin a $1.3 billion deficit in the state budget, his first job wis eliminatin the deficit. Roemer callit a special session o the legislature tae push an ambitious tax an fiscal reform program for state an local govrenments. He vowit tae sleesh spendin, abolish programs, an close state-run institutions. Voters rejectit his proposals in a statewide constitutional referendum. In Mairch 1991, Roemer switchit tae the Republican Pairty juist months afore the state elections, apparently at the urgin o Bush White House Chief o Staff John H. Sununu. Roemer lost his re-election efter loosin the Republican primary tae David Duke. Duke wad suin loose tae Edwin Edwards. Roemer left office on 13 Januar 1992. He wad run again for the Republican nomination for govrenor, but lost tae Mike Foster. In the simmer o 2004, Roemer briefly considerit enterin the race tae succeed reteerin U.S. Senator John Breaux. Roemer shortly efter decidit nae tae run for the senate. Roemer haes nae yet annooncit on whether or nae that he will run for Govrenor o Louisiana again in 2015 tae replace Bobby Jindal. Roemer wis marrit tae Cookie Delmer till thay divorcit. Then he marrit Patti Crocker until thay divorcit. He is nou marrit tae Scarlett Roemer. Roemer haes three childer wi Delmer. 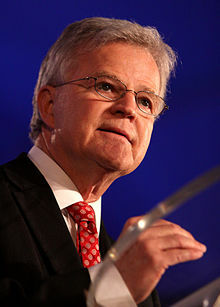 ↑ 1.0 1.1 1.2 1.3 1.4 "Buddy Roemer Fast Facts". cnn.com. CNN. Retrieved 30 August 2015. ↑ Duckler, Ray (October 2, 2011). "Surprise! Roemer's running". Concord Monitor. ↑ Tilove, Jonathan (February 22, 2012). "Buddy Roemer gives up GOP bid to seek two third-party nods". The Times-Picayune. Retrieved February 23, 2012. ↑ Liptak, Kevin (May 17, 2012). "Third party effort packs it in for 2012". CNN. Retrieved May 17, 2012. ↑ "Former GOP Presidential Candidate Buddy Roemer Calls For Gary Johnson to Be Included in Romney and Obama's Presidential Debates". Retrieved August 2, 2012. ↑ "ROEMER, Charles Elson (Buddy), III". Biographical Directory of the United States Congress. Retrieved February 22, 2012. ↑ 8.0 8.1 Mullaney, Marie Marmo (1994). Biographical directory of the governors of the United States, 1988–1994. Greenwood Publishing Group. p. 149. ISBN 978-0-313-28312-3. Retrieved February 4, 2011. ↑ 9.0 9.1 9.2 Fuerbringer, J. (June 12, 1987). "Roemer finds poker valuable". The Times-News. Hendersonville, NC. New York Times News Service. p. 24. Retrieved February 5, 2011. ↑ "Governor Buddy Roemer is a Maverick Southern Politician". Waycross Journal-Herald. Associated Press. October 16, 1990. ↑ Fuerbringer, Jonathan (June 10, 1987). "WASHINGTON TALK: Avocations; Networking at the Poker Table". The New York Times. ↑ "Trio in Louisiana make up unusual slate for governor". The Milwaukee Journal. Associated Press. March 18, 1991. ↑ "A Louisiana Governor for President – Weekly column by John Maginnis". LaPolitics.com. Archived frae the oreeginal on Jan 26, 2011. ↑ "Buddy Roemer for president?". The New Orleans Times-Picayune. Archived frae the oreeginal on Feb 4, 2011. Retrieved Feb 4, 2011. ↑ Krupa, Charles (November 30, 2011). "Buddy Roemer to seek Americans Elect third-party nomination for president". The Times-Picayune. Retrieved February 22, 2012. ↑ Linkins, Jason (December 1, 2011). "Buddy Roemer Throws In His Lot With Americans Elect – Which Is A Huge Mistake". Huffington Post. Retrieved February 22, 2012. ↑ Buddy Roemer for President. "Thank You for Your Support | Buddy Roemer for President". Buddyroemer.com. Retrieved 2012-08-20. ↑ Greater New Orleans (2013-12-12). "Buddy Roemer to spearhead long-term policy initiative ahead of 2015 election". NOLA.com. Retrieved 2013-12-18. Wikimedia Commons haes media relatit tae Buddy Roemer. This page wis last eeditit on 2 Mairch 2018, at 21:36.